da soinu hau egin duna. Our dear Violeta,/ let dance this march,/ the right foot first,/ and then the other one./ Look at the Basque people/ with their overjoyed heart,/ breaking the chain/ as a pair of shoes.// I never should believe/ you were so changing./ You were born in America,/ got into among us./ There is in the world no other/ thing more beatiful than this,/ without knowing how to be/ alive after death.// This is a widow march,/ seldom listened,/ but known in Chile,/ surely you shouldn’t know,/ friend Violeta Parra,/ very known singer,/ since today half Basque,/ is who compossed this melody. 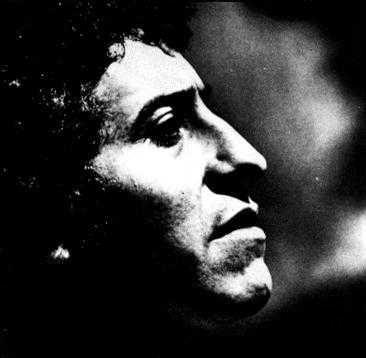 Víctor Jara (Víctor Lidio Jara Martínez; San Ignacio, 28 de Septiembre de 1932-Santiago de Chile, 16 de Septiembre de 1973), Chilean musician, songwriter and theater director. Son of peasants, he became in the great referent of the New Chilean song and in a standard of the revolutionary and solidary international song. Víctor’s songs talks about the Chilean workers and peasants unfair way of life, about the revolution and about love. He colaborated with others great Chilean songwriters and groups as the Parras (children and relatives of Violeta Parra) or Quilapayún. He supported the campaign of Salvador Allende for president. During bloody Pinochet’s coup-d’etat, he was arested, tortured and killed, only for sing songs of hope and justice. Some of his records: Canto libre –Free song- (1970), El derecho de vivir en paz –The right of living in peace- (1971), La Población –The population- (1972) and many others. This song was dedicated to the memory of Argentinan revolutionary Ernesto “Che” Guevara. But, in some way, is almost prophetic about his life. He opens paths by the hills,/ leaves his step on the wind,/ the eagle gives him the flight/ and the silence shelters him./ He never complained of cold,/ he never complained of sleepy,/ the poor one feels his pass/ and he follow it as if he were blind./ Run, run, run,/ by here, by there, by yonder,/ run, run, run,/ run for they are going to kill you,/ run, run, run./ His head is crowned/ by golden talons crows/ how he has been crucified/ by the powerful one’s fury./ Son of rebellion,/ twenty plus twenty pursue him,/ because he give away his life/ they want to kill him. (1) This is an antique use of the participle “aparecido” (“aparecer”: “to appear”), that means “spirit”, “ghost”. Other name is “aparición”. (2) A recurse that uses to appear in children’s game songs, which literal English translation were “run it –or- run him, run her”. For your life we shall sing/ for your death a song/ we shall sing for your blood/ companion, Savador.// For your life president/ for your death companion/ you left us your flags/ Saviour (1) of the workers.// By the wide alamedas (2)/ partner president/ people shall march again/ with his fighter shout.// For your life we shall fight/ for your death with courage/ we shall fight for your example/ Salvador, partner.// May the martyrdoms get over/ in your betrayed land/ may be born again the ears/ of the released land.// The unity of the whole people/ is the libertarian strenght/ we will deliver your word/ Salvador (1) of the victory.// The soldiers came/ death on the population/ they took the worker/ they put him in prison.// All the peasants/ under the landlord’s yoke/ and all the workers/ to the wall.// The snatched bread/ misery and destruction/ hunger, torture and fetters,/ guns of the opression.// Against the Chilean People/ the treason has risen/ but we shall defeat it/ there won’t be resignation.// In the miner soul/ borns the insurrection/ its haughty fist rises/ against represion.// For Chile we shall overcome/ for its liberation/ for a new homeland/ for the revolution. (1) Untraslatable game of words: “salvador” –saviour- is also a proper name in Spanish. (2) A reference to the last Allende’s discourse: a retoric figure that means “freedom”. 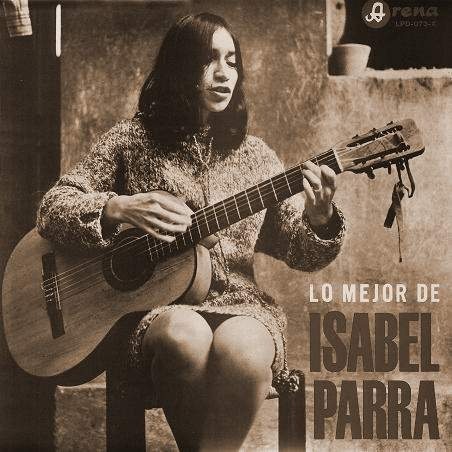 Isabel Parra is great Chilean songwriter Violeta Parra’s daughter, and, like her mother, one of the greatest voices of the Nueva Canción Chilena (New Chilean Song). She begun to sing with her mother popular tunes on several places of Santiago de Chile, but her discographic career begun as duo with her brother Ángel in Paris. Both founded the Peña de los Parra. After Pinochet’s coup-d’etat (March, 1973), Isabel lives in France, occassionally in duo with other Chilean songwriter, Patricio Castillo. In 1987, she get back to Chile (a resume from this Wikipedia article). ¿cuál era su gran delito para esa suerte correr? En la playa descansaba el cuerpo de una mujer. el mar le trajo un recuerdo pero el cuerpo no le oyó. La muerte reinaba altiva dentro de aquel corazón. Su piel era un manto blanco que la luna acarició. también el cielo y las nubes y el viento de aquel lugar. El mar envuelto en tinieblas vio llegar al criminal. esa mujer no está muerta, pero se tuvo que ir. A esa mujer la conozco, una voz se oyó decir. The newspapers bring news about a crime that happened,/ they found a breathless, warmless human being,/ a brutally mistreated woman’s body,/ which was her big crime for having that fate?/ On the beach was resting a woman’s body.// She was there a whole night, just cold sheet her,/ her skin was a white cloak that moon caressed,/ the sea brought her a memory but body didn’t hear it./ Death lordy reigned in that heart./ Her skin was a white cloak that moon caressed.// The sea covered in darkness saw the criminal coming,/ he saw him coming with his fashion of terror and cruelty,/ the sea wants to find the killer’s trail,/ sky, clouds and the wind of that place too./ The sea covered in darkness saw the criminal coming.// I know that woman, a voice was heard,/ that woman is life that can’t die,/ that woman is soil that makes to sprout the corn,/ that woman is not dead, but she had to go out./ I know that woman, a voice was heard.